Ensure is a nutrition supplement drink, often used to boost calories, protein and other nutrients for anyone who is not eating well or trying to gain weight. One 8-ounce bottle of original Ensure provides 220 calories and 9 grams of protein. It’s nutritionally balanced to provide a healthy mix of protein, carbs and fat, as well as vitamins and minerals important to maintain good health. Ensure is convenient to use, but not your only option when you're trying to boost nutrient intake. Ensure is often recommended or prescribed by health care providers to add extra calories, but there are other supplement drinks and powders available in many grocery stores, super stores and pharmacies. Some of these products are marketed as convenient breakfast replacement drinks for anyone on the run or as meal replacements for someone looking to lose weight. A quick comparison of the nutrition facts label will show that they are fairly similar in terms of calories, protein, carbs and fat content and a good alternative to drinking Ensure. 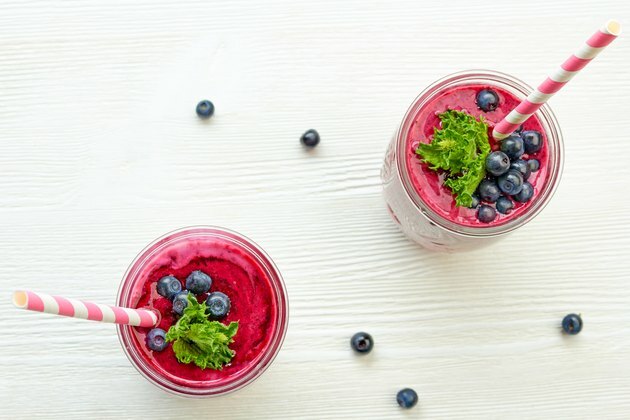 If taste or ingredients are a concern in Ensure or other manufactured supplement beverages, it’s easy to make your own protein smoothie by blending regular or nondairy milk with some protein powder and fruit. The American Cancer Society also recommends boosting calories and protein by drinking fortified milk — a mixture of 1 quart of whole or low-fat milk plus 1 cup of powdered nonfat milk. Blending fruits or vegetables with a protein food like Greek yogurt, cottage cheese or tofu plus juice or milk is another way to make a protein supplement that's tailored to your taste and needs. Eating small high-protein and high-calorie snacks is another way to provide extra calories and nutrition and an alternative to drinking Ensure. Snacks that provide a similar amount of calories and protein include a 5-ounce container of Greek yogurt plus a serving of fruit, about 1/2 cup of trail mix, or two hard-boiled eggs with a mini box of raisins. Although Ensure may be helpful or necessary for some individuals who are unable to eat enough calories, the best alternative to supplement drinks is to eat a healthy, balanced diet each day. Nutritionists recommend eating several meals and snacks throughout the day, each of which includes a generous serving of fruits and vegetables, a source of lean protein like chicken or fish, and a small serving of whole grains like whole-wheat bread or cereal, or brown rice. Three small servings of regular or nondairy milk or yogurt helps to round out your protein and adds additional vitamins and minerals. Supplements are meant to be just that: supplements to your regular diet. If you're having trouble eating all the nutrients you need, focus on eating foods that are easy to digest. Fibrous green vegetables are important in your diet, but they make you feel full and are difficult to digest. Peanut butter is an example of a high-calorie, protein-rich food that you can use as a spread or eat alone. Two tablespoons of peanut butter provides about 200 calories, according to USDA Nutrient Database. Other spreads, like hummus and guacamole help you pack calories and nutrients into your meals. Cook food with extra butter, olive oil or canola oil to quickly increase fats and calories. An article from the Cystic Fibrosis Foundation recommends adding ingredients like heavy cream, maple syrup or chopped nuts when appropriate to add calories.